I’ve always wanted a good pair of riding boots. But with two different sized feet, finding a pair that fits is a near impossible task. 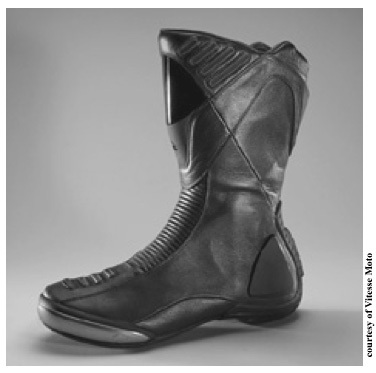 Motorcycle boots need to be flexible enough to allow shifter and brake use while still providing adequate ankle support in the event of a get-off. On top of that, they need to be weather proof and be comfortable to walk in once the ride ends. Vitesse has hit all targets with their Glove line of road riding boots. These stylish riding boots are made from genuine American cowhide. The rubber sole is formed to fit foot-pegs nicely and offer all-day riding or walking comfort. Armored shin pads and ankle plates protect you from impacts. The toe guards are zinc alloy and make cool sparks when they touch down in hard corners. Only the left boot is equipped with a wear-pad on top for the shifter. Riders on old British bikes or Ironhead Sportsters will still have to duct tape their right boot for now. Vitesse says they are considering adding the shifter pad to the right boot both for symmetry and to accommodate vintage bike riders. Large hook and loop pads allow the boot uppers to be adjusted to fit either inside or outside your pants cuff. Even the zipper pull for the boot-lower has a swath of hook and loop on it to hold it in place so that the zipper does not slide down while riding. Nice detail, Vitesse. Generous gusseting on both the front and rear of the ankle area allows excellent range of ankle movement whether you ride a foot-forward cruiser, a race-tuck super-sport or even a step-through scooter. As Vitesse themselves say on their website “We do not believe the type of injuries depend on the bike. A crash on a moped can be just as bad as a crash on a sport-bike”. They put this philosophy into form by building riding boots that work beautifully, no matter what you ride. While Vitesse makes no claim about the weatherproof level of their boots, I repeatedly rode in the rain during testing and can report they worked GREAT. My feet stayed totally dry in spite of repeated dousing. The lightly treaded soles mean you should step carefully on wet surfaces. The break-in procedure is straightforward. Simply put the boots on and you’re done. They are all-day comfortable right out of the box. No stiffness or rubbing occurred whether walking or riding. Vitesse uses Euro sizing for their boots so you will need to consult a conversion chart. Their “US size 12” fits my size 10 ½ foot perfectly and only slightly oversized on my size 10 foot. Editor Pearman felt they ran a half-size small on his wide feet. If you know your Euro size, order one or two sizes larger. Suggested retail is 200 Euros ($267.00) plus shipping. The entire Vitesse line is available exclusively at Vitessemoto.com. Credit Card or Paypal orders are welcome. A US dealer distribution program is in the works. The features, fit and finish of these boots are fantastic. While there may be lower priced boots on the market, I doubt you’ll find a better value than the Glove riding boots from Vitesse.